ONKI Light is a SKOS vocabulary browser that can be used by content indexers and information seekers to search for vocabulary concepts and terms. It is built as a web application on top of a standard SPARQL endpoint. In addition to the web interface, it provides a REST API for machine access as well as RDF / Linked Data download access to individual concepts and whole vocabularies. 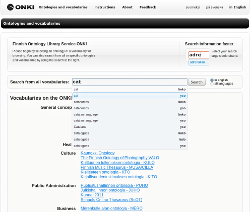 See the ONKI Light demonstration for a list of available vocabularies and to try out the user interface. The ONKI Light software (PHP web application) including the source code and documentation (in the wiki) is available at the project page on Google Code. The software is distributed under the MIT license.